(From left) UOB Personal Financial Services Singapore head Jacquelyn Tan, Loh, Ku sign a Memorandum of Understanding to drive e-commerce growth across Asean. 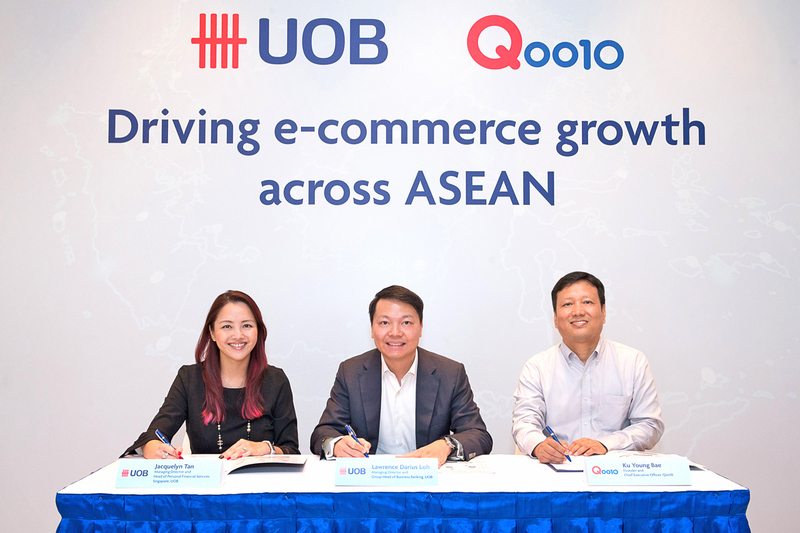 SINGAPORE: United Overseas Bank Ltd (UOB) and Qoo10, a leading e-commerce platform, announced that they have formed a strategic regional alliance to drive e-commerce growth across Asean. The strategic regional alliance supports the bank’s approach to build ecosystem partnerships and its efforts to bring banking services closer to consumers and small businesses across Asean. Qoo10, with more than three million buyers, is the top e-commerce platform in Singapore. In January this year, Qoo10 launched QuuBe, a blockchain-based e-commerce platform which already has more than two million products on the marketplace. Through the alliance, Qoo10 will be able to tap UOB’s holistic suite of financial solutions to help consumers and merchants buy and sell products more easily on both the Qoo10 and QuuBe platforms. Both organisations will also promote each other’s products and services to create greater value for their customers across Asean. Small businesses will also be able to apply for financing directly on Qoo10’s site. Singapore-based merchants who have been using Qoo10 for at least six months will have their loan application processed in just one business day. By the second half of the year, merchants will be able to apply for business loans directly on Qoo10’s site instead of having to submit physical documents such as the company’s financial statements to the bank. The bank is also exploring the use of artificial intelligence to cut down the credit assessment process so that business owners can receive an outcome on their loan application in the same day. UOB Group Business Banking head Lawrence Loh, said the strategic regional alliance complements the bank’s efforts to help small businesses seize opportunities in the digital economy. “With the e-commerce market in Asean poised for growth, small businesses are also looking to increase their sales on online channels. Our alliance with Qoo10 enables us to extend our touchpoints to provide small businesses with the financing they need directly on the e-commerce site, helping them to take advantage of opportunities quickly as they arise. This initiative, along with our range of banking and digital solutions, will enable us to provide better and timelier support to the thousands of small business owners across the region pursuing their growth ambitions,” Loh said. “As a premier online shopping platform, our goal is to bridge the gap between online buyers and sellers seamlessly,” said Qoo10 chief executive officer Ku Young Bae. The strategic alliance will also support Qoo10’s efforts to grow its QuuBe marketplace. The platform provides merchants a more cost-effective way of selling online by removing service or transaction fees that are usually imposed on online sellers. To help more merchants get started on the QuuBe platform, UOB will provide them with credits which can be used to market their products and services when they sign up for a UOB account1. UOB cardmembers can also enjoy privileges such as additional 10 per cent in Q*coins2, a private blockchain-based token, when they shop on QuuBe. The bank will also provide Qoo10 with banking services as the e-commerce platform deepens its presence in the region.